Focus on Feed-in Tariffs (FiT) at the state level for solar. On the eve of Intersolar North America 2008, Monday, July 14, 2008, I managed to attend the 1st Solar Symposium sponsored by the German American Chamber of Commerce (GACC), California Branch. Although the 1st GACC “Solar Symposium” Fully Booked – International Audience Expected, I was able to jump from the wait list to an attendee despite my over aggressive accreditation tactics. Before lunch, SEIA (Solar Energy Industries Association) President Rhone Resch presented “The US Prior to the 2008 Presidential Elections – Status and Perspectives of Solar Promotion on a Federal Level”. The ITC (Investment Tax Credit) myopia continues as HR 6049 is supposed to be coming up for another vote in the Senate soon. There was no mention of the first national Feed-in Tariff bill, HR 6401 Renewable Energy Jobs and Security Act, introduced by U.S. Representative Jay Inslee (D-WA). Please see PVSC 33 Opens and Feed-in Tariffs: Solar FiT for the USA for related posts. When it comes to Energy policy much of it is lead at the state level rather than at the Federal level. Most of the most critical electricity related rules and regulations are set at a state level. This observation was echoed by many panelists who advocated activity at the state level over complex and protracted energy policy legislation at the Federal level. 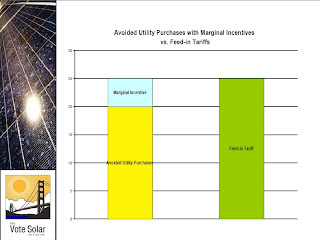 However, a misleading comparison of Rebate programs with net metering versus the Feed-in Tariff model is shown in the slide above titled “Avoided Utility Purchases with Marginal Incentives vs. Feed-in Tariffs”. …From a policy maker’s perspective we are looking at what is the amount of public funds, the above market cost, that they are going to need to have to provide to a program in order to make that program work, give a financially interesting proposition to people who want to go solar. Under this particular model, most of the value comes from avoided utility purchases and you give an incentive that is just the marginal difference to get to an economically interesting proposition. Under a Feed-in Tariff, you must provide the full value of that electricity and from the policy maker’s perspective that often looks like a much larger amount which makes it harder to do. This perpetuates Adam Browning’s flawed Feed-in Tariff versus Marginal Incentive article refuted by Michael Hoexter in Feed-in Tariffs: Getting off the Renewables Roller Coaster, both found at RenewableEnergyWorld.com. Despite all the noise from California, if I may be blunt, the truth of the matter is 95% of all renewable megawatts in this state were built in that period (1980’s). In the entire 15 years since then, most recently since the 2002 passage of the Renewable Portfolio Standard, the 20% standard by 2017 which has since now been advanced to 2010. We are not much closer to that goal than where we started. We have In fact lost ground from about 12% to 11%. I think our goal should be exactly like you (John White) said; the fastest possible introduction of the largest possible quantity of renewable energy. And now let me again make my pledge why the Feed-in tariff works, the German model. The reason is it is not based on people who like PV and who are happy to get a tax credit to get a lower priced PV; this is nice, and nobody would be against it. But the key issue is to provide an interesting investment proposal, a business plan, so that anybody can sit down and say my roof has this size I can produce 5kW (kilowatt) of PV. It means at the end of the day when I have paid down the system I get each month a paycheck. Net metering is wrong. Net metering is the wrong way. Net metering means the best you can achieve is bringing your utility bill to zero. And this is just against what we all try to do on the energy savings side. Energy efficiency and conservation efforts do not scale with net metering as noted in my AB 1920: California bill goes beyond Net Metering post. As a consequence, I don’t think it’s too much of a stretch in terms of normal governmental authority to see the logic of Feed-in Tariffs. Now there are those that will differ. They will say that’s delegating to the states an awful lot of authority. I’m here to tell you in my adult lifetime, national energy policy as much as I have known about it, has almost consistently been headed in the wrong direction. And I put a lot more comfort in seeing those decisions made by the states. I like what Germany has done with its Feed-in Tariffs; they apparently worked. We could try all kinds of models, but it seems to me we start with a model that works. He encouraged the panelists to reach a consensus and work to get a FiT policy in place for California. The Lt. Governor Garamendi also observed California policies at the city, county, and state levels need to be integrated and aligned to achieve the goal of transitioning from fossil fuels to clean, renewable energy. Last year when I asked the Lt. 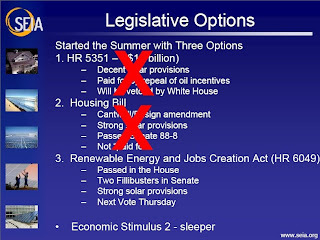 Governor about Feed-in Tariffs for renewable energy at the 2007 CCTO Competition (please see California Clean Tech Open 2007 Kick-off Event Wrap up), they were not at forefront of his considerations. 1st “Solar Symposium” of the German American Chamber of Commerce an Immediate Success has additional quotes and the GACC’s perspective. Although they claimed to have FiT policy efforts, CALSEIA (California Solar Energy Industries Association) did not respond to my requests for details about their proposed approach to a California Feed-in Tariff for solar. California has an immaculate convergence of great solar resources, sustainability and environmental awareness, renewable business ventures, and progressive political support to Go Big Solar driven by a German style Feed-in Tariff. Is a foolish name change to Freedom Tariff or Energy Independence Tariff needed before we can adopt sound renewable energy policy as our own? Every state across the country should not hesitate to immediately implement a plan of action and a type of legislation termed Renewable Energy Payments or REP's. The policy behind REP's has been called "the world's best renewable energy law". It has proven to promote the fastest, cheapest, and widest growth of renewable energy. Its core principles are: 1. access to the power grid, 2. long-term guaranteed prices, and 3. no limit to the amount of renewable energy that can be sold to the utility companies. In the US, energy policy is set at the national and state levels. Recognizing that our Federal Government is doing far too little to promote renewable energy, every state government needs to take leadership. The US consumes 25% of the world's oil, but only has 3% of the world's oil reserves. Our national and state economies are overly dependent on oil. Developing our own renewable energy breaks our dependence on Middle East and other foreign oil, thereby increasing our energy security. Renewables will help to solve global warming, and create millions of new well-paid jobs. Every state has more than enough renewable energy from the sun, wind, water, biomass and/or heat from the earth, to meet their needs. Renewable energy can be used for heating, cooling, electricity, and as fuel for machinery and transportation. Once the investments are made to buy, install and maintain solar panels, wind turbines, etc., the actual "fuel" is free and ongoing. Compared to the costs related to fossil fuels-extraction, production, transport, pollution, illnesses, and wars-clean renewable energy is cheap. While fossil fuels pollute the environment and cause global warming, renewable energy is clean. The most effective legislation to stimulate a rapid transition from fossil fuels to renewable energy has been pioneered in Germany. This has made Germany the world leader in the production of solar panels, creating 234,000 jobs. In the 1980s the US had an 80% share of the solar panel market; today we have 25%. The German legislation is so effective that over 45 other countries, states and provinces have adopted similar laws with great success. We must remember Germany has the same number of peak sun hours (3) per day as southern Canada. Most states receive an annual average of twice this amount of solar resource per day. This legislation encourages people and groups to install solar panels, wind generators, etc. to produce energy and sell it to their power company at a price guaranteed for 15 to 20 years. People are eager to install this equipment, as they will recoup their investment in about 9 years and have a steady stream of income after that. This increased demand creates jobs, conserves fossil fuels, and lowers greenhouse gas emissions-Germany is on track to meet its reduced CO2 emissions targets three years early. This simple idea that is producing astonishing results elsewhere has received little attention in the USA. It can help states reach their CO2 reduction targets, and their goals to have a percentage of their energy come from renewables by a set date. Climate chaos, escalating fuel prices, and wars show us that we need to switch from fossil fuels to renewable energy. We have the technology, know-how, and resources. Now we need leadership from our state government. We can all be innovative leaders in renewable energy. With REP's we can do the most to help our country make a rapid transition from fossil fuels to clean renewable energy. By being a leader in clean renewable energy, we will create many thousands of well-paid jobs, improve public health, and help stop global warming. By reducing our dependence on imported fuels, we will keep the revenues of the energy industry within each state and increase our national security. Efficiency – Renewable energy can be produced right where it's used, so almost nothing is wasted. Security – Currently, accessible renewable resources can deliver six times more energy than all the people on this planet use every day. Investment – Governments should support future technology that has the capacity to solve energy problems with clean, affordable energy for everyone. Ecology – Most renewable-energy fuels produce no emissions. The quicker we switch, the quicker we can stabilize our climate and prevent catastrophes. Independence – Renewable-energy technology produces energy in diverse, small-scale ways, allowing energy independence for everyone, everywhere. Cost – Renewable-energy fuels are free. The sun and wind do not increase their price, and technology will become cheaper as the market grows. As a result, our valuable water supplies are left to meet other needs. Economic Growth – Renewable energy provides stable fuel prices while creating a large number of high-skilled jobs in many sectors. The benefits are spread throughout society. Similar legislation is being introduced in Washington, DC, Florida and Michigan. I work for Lt. Gov. Garamendi and was at the event with him. He’s really interested in the feed-in tariff model and has been meeting with some German government representatives. Feel free to contact me with any suggestions for how he can help to promote growth of the solar industry in California. Michele Gault http://www.ced.ca.gov – go to the “Contacts” page. I applaud the efforts to explore Feed-in Tariffs for California, however, it is still difficult to understand how to get meaningful discussion of this issue in the State of Indiana where we have yet to even get a state RPS enacted. Plus our net metering policy is anemic as well. Any suggestions on how we can get out from under the coal cloud and into the sun? I have been writing on renewable energy issues since January 2008 for the newly formed Indiana Renewable Energy Association. Please visit our blog at http://www.indianarenew.blogspot.org. Paul Gipe is scheduled to visit Indiana in September and to discuss feed-in tariffs. Any suggestions how to turbo charge this discussion?